I wanted to do a theme for our family but daddy was away (Afghanistan) so it was just boys and myself. 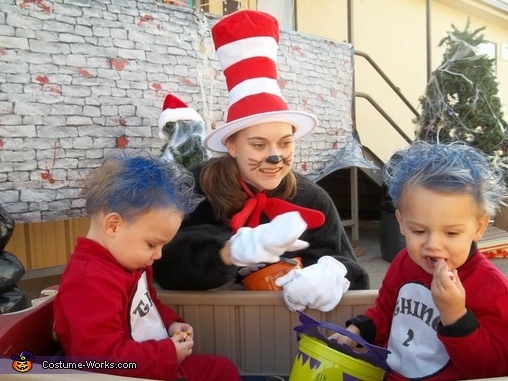 I made a Cat in the Hat costume, and they (being twins) went as Thing 1 and Thing 2. We had just moved so I didn't have a lot of time to make costumes. For theirs I used red sweatsuits and embroidered on patches that said "Thing 1 & Thing 2" and sprayed temp. Blue hair dye on their hair. For me, I made a cat costume from a pattern and purchased the hat, gloves and bow tie. Very easy! The most creative beautiful costume ever! I love it!